At Central we work hard to remain engaged in the work of our community. In addition to the opportunities listed below, Central supports local organizations like One Roof, Bridging the Gap, the Salvation Army, Habitat for Humanity, Angel’s House and a number of other organizations. Each Tuesday, prepare around 150 meals. Then deliver them free, along with a side helping of care and friendliness, to needy and shut-in persons in the community. In a nutshell, that is what “Feeding Our Friends” is all about. A faithful group of volunteers has been making this happen week-in and week-out for over thirty years. When the ministry began, volunteers were delivering 40-45 meals, which has grown over the years to the current number. Those receiving meals are referred to the church through friends or by social service agencies. Since Christmas Day 2018 and New Year’s Day 2019 gave a well deserved break to the Feeding Our Friends volunteers, they packed and distributed boxes of Christmas grocery provisions to the needy on December 18, 2018. To learn more about how you can join or support Feeding our Friends, email Courtney Haynes (chaynes@centralbaptistnewnan.org). Our Helping Hands Ministry aims to do little things that can make a BIG difference. Suppose you’re old and can’t get up on the ladder to change a light bulb. Or you’re not able to install the wheelchair ramp that’s needed. Those are the kinds of jobs that are tackled by Central’s “Helping Hands Ministry.” The program’s volunteers have done carpentry, painting, yard work, and other miscellaneous things around the recipients’ homes. They have taken people to doctors, bought their groceries, or picked up their medicine when it was difficult for them to get out of the house. A new area added in 2009 was provision of wheelchairs, walkers, or canes to the elderly to help prevent an accident from happening. 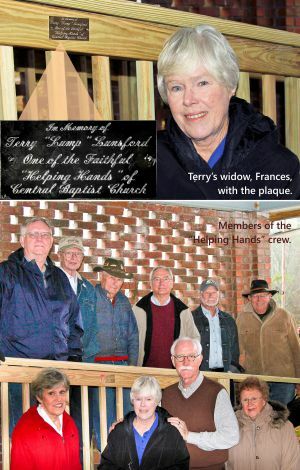 “Helping Hands” has been in operation for over nine years as a formal ministry. Previously, volunteers would do work in the community on an ad hoc basis. As much as the volunteers would like to meet a huge number of needs, the available assistance is limited by resources. Referrals come from someone within the church or from an agency. Central Baptist is a proud sponsor of Scouting. Learn more about our Scout Troop by clicking the link below.